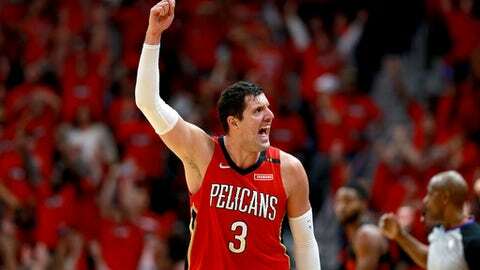 NEW ORLEANS (AP) Nikola Mirotic watched his third 3-pointer of the first half swish through the hoop, turned to acknowledge the raucous, roaring crowd and raised his first triumphantly as he trotted back up court. Portland had a hard enough time dealing with Pelicans All-Star Anthony Davis and the New Orleans backcourt of Jrue Holiday and Rajon Rondo in Games 1 and 2. Pile on the finest playoff performance of Mirotic’s four NBA seasons, and the rout was on in Game 3. Mirotic scored a career playoff-best 30 points to go with eight rebounds, three steals and a block, and the Pelicans pushed Portland to the brink of elimination with a 119-102 victory on Thursday night. To illustrate how hard New Orleans has been to defend in the series, Portland coach Terry Stotts made a point of noting that Mirotic was the third different Pelicans player to score 30 in a game. Davis had 35 in Game 1 and Holiday 33 in Game 2. Davis had 28 points, 11 rebounds, three steals and two blocks for New Orleans, which can advance past the first round of the playoffs for the first time since 2008 with one more victory. Game 4 is Saturday. The 6-foot-10 Mirotic, acquired in a midseason trade after DeMarcus Cousins‘ season-ending Achilles tear, made 12 of 15 shots, scoring on everything from quick-release 3-pointers to cutting dunks and fast-break layups. Damian Lillard scored 20 for Portland, but missed nine of an unusually low 14 shots. He averaged about 19 shots per game this season, but said the Pelicans were defending him relentlessly. CJ McCollum scored 22 and Al-Farouq Aminu added 21, but Portland trailed by double digits for most of the first half and all of the second. The Blazers had no answer for a Pelicans offense orchestrated once again to prolific effect by Rondo, who had 16 points and 11 assists – giving him 37 assists in the series. Holiday added 16 points for New Orleans, which shot 53 percent (46 of 87). Trail Blazers: Starting F Evan Turner was scratched because of his toe injury sustained during Game 2 on Tuesday night. Maurice Harkless started in his place, scoring five points in 26 minutes. … The Blazers committed 24 turnovers, leading to 29 Pelicans points. … Finished 9 of 31 from 3-point range. Pelicans: Cousins was on the bench, attending his first game in New Orleans since his injury on Jan. 26. When he was shown cheering on his teammates on the main scoreboard, fans erupted into chants of ”Boogie! Boogie!” … The Pelicans shot 11 of 27 from 3-point range and 16 of 19 on free throws. … Scored 62 points in the paint and 32 on fast breaks. The Pelicans wore alternate red uniforms and every fan was given a matching T-shirt, turning the entire packed seating area into a sea of red. The volume was high early with the crowd revved up for the first playoff game in New Orleans since 2015. The Blazers did nothing to silence the place, shooting about 35 percent and committing six turnovers in the opening quarter. New Orleans raced to an 18-point lead in the period, aided by Mirotic hitting five of his first seven shots for 14 early points. Mirotic scored 21 by halftime, which already represented a playoff career high. Davis joined the fray with his typical array of alley-oop dunks, one of which he caught with his back to the basket and threw down with a two-handed reverse jam. Rondo ran New Orleans’ offense with a tempo that gave Portland fits, and even when he was forced to settle for a deep 3 late in the shot clock, it went down, pushing the Pelicans’ lead to 20 in the first half. Portland never got closer than 13 after that and trailed by as many as 33 in the fourth quarter. The series remains in New Orleans for Game 4 on Saturday night, when the Pelicans have an opportunity to complete the first playoff series sweep in franchise history.